The National University of Ireland, Cork will this year host GSI's Annual Seminar of the Irish National Seabed Survey (INSS) on 18th November. The venue will be the Devere Hall on the first floor of the Student Centre behind the Honan Chapel on Donovan's Rd (eastern side of campus). The annual seminar is now arguably the foremost information and discussion forum for the Irish marine science community. Indeed its sphere of importance is now extending overseas, with a sizeable number of international visitors emerging each year. The 2004 seminar, held in Galway, attracted more than 120 interested parties. The shift in focus from data acquisition to data usage and value added projects, adopted by last year's seminar will be maintained this year. Hence most presentations will outline research projects and industry applications arising out of INSS data. Data acquisition in 2005 will be presented also. As usual, the seminar will incorporate an exhibition involving poster displays, video, maps, products and seabed samples. Also, as with other years, a CD-rom of the seminar will be available for distribution shortly after the seminar. Previous year's seminar reviews are available here. An additional important element this year will be the provision of a booklet detailing short overviews and illustrations of the various presentations. This will be available on the day for all delegates. This year a poster and welcome reception will be hosted by the Marine Institute in the Staff Restaurant at the university on the previous evening, Thursday 17th from 7-9pm. A broad range of posters will be on display, detailing many of the activities and associated projects of the INSS, together with other Irish marine activity. If you wish to submit a poster, please send brief details of its content and expected size to Andrew Wheeler [a.wheeler@ucc.ie]. There will a standard fee for posters stands if required. "The ABC* of the INSS"
Details of how to get to UCC can be found on http://conferencing.ucc.ie/HowToGettoUcc.htm Detailed maps of Cork City can be found on http://www.corkcorp.ie/maps/maps/tile_introa.html with UCC on Tile 30. 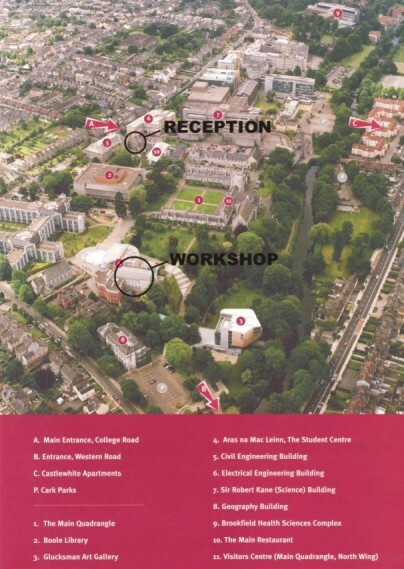 The UCC Campus map can be found on http://conferencing.ucc.ie/MapUcc.htm. The Reception will be in the south wing of the Restaurant block by the Main Entrance off College Rd behind Civil Engineering. The entrance to the Reception is from the Green where the Observatory is housed. The Seminar will be held in the Devere Hall on the first floor of the Student Centre behind the Honan Chapel on Donovan's Rd (eastern side of campus).